Finally!!! I've been checking for updates multiple times a day every day for the past 2 weeks in hope to get a new OS upgrade that may solve the issue of random freezing of the phone when trying to unlock it. Mine just popped up as well on my 928C. If you're using package disabler make sure you enable everything before updating. I didn't use package disabler but I did disable Messenger + Hangouts from the Application Manager in the phone itself. Is that a problem? I already did the update? It should be fine. It's just for package disabler since it disables core services that you wouldn't normally be able to disable without root. Also, G928C got the update today but nothing on my G9287 so far. now why didn't the OS version change if it claims all those bug fixes? I thought it should become Lollipop 5.1.2 right? How to these OS updates work if the version didn't change? That's not entirely how it works. 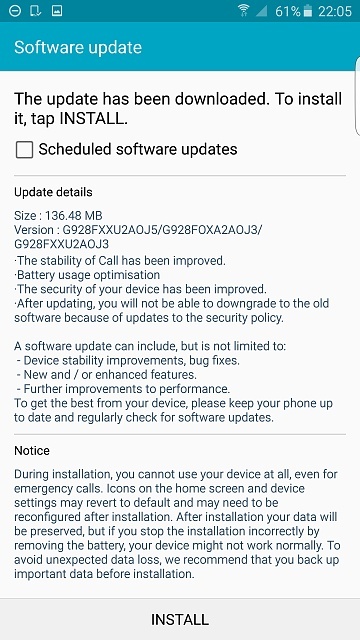 This isn't an Android version update, it's just a firmware update from Samsung. If you look under the "About Device" section you will see the Android version and the Samsung firmware version. Right, I really hope it fixes the random lock screen freeze issue. That's the only thing which took my stance about this phone from the initial "0 lag factory + snappy phone" to the worst phone I bought this year. I really want to use it as it was intended to, snappy + best camera. who is your carrier, and do all carriers get this down load? First thing I noticed is that now the battery drain on standby is fixed! Usually my battery life would drain from 100% to 70% in 2 hours even if I don't touch the phone! Now I went to the Gym and the battery life was 100%, finished the Gym after 2 hours and the battery life is still 97%!! This is how this phone should be. Didn't experience the freezing bug so far but I guess this is too soon to judge yet as I had just done a factory reset after the firmware update just to ensure everything is 100% right. If the battery drops 30% in 2hrs while doing nothing, then there's seriously something not right. You should try to limit the amount of apps running in the background, or worst case reset your phone. Also, 3% drop in 2hrs is the norm for this phone. I usually get a 10% drop overnight on a 8hr sleep, night clock takes a few % more. I woke up this morning and got the cursed freeze upon unlocking, seems like the phone when it goes untouched for a long time it enters a deep sleep mode which causes this. It took about 30 seconds for the phone to function right before that no matter what I did it wouldn't register! Damn it! yes indeed, and that included a full factory reset and wiping the cache partition. Damn this phone! Expensive $1000 USD phone that freezes! Great! I swear to God this is my last Samsung phone I get! I know the issue doesn't happen all the time, but I shouldn't be dealing with this when I paid such a premium. I understand your frustration - unfortunately, I feel the same way about my iPhone 6S Plus. Ever since I've installed iOS 9.1, the phone's been glowing hot and the battery won't last a day anymore. Took it to apple - they told me it's 'within specs'. So basically, I have a 1000$ paperweight here. Already did full factory reset, set it up as a new phone etc. nothing works and Apple doesn't care. This doesn't relate to your problem - all I'm trying to say is that you can always get a dud, no matter the manufacturer. Have you talked to Samsung about it? did i do any physical hardware damage to my s6?